When I visited the Run Expo as part of the Walt Disney World Marathon Weekend, one of the companies exhibiting at the expo was Yurbuds, headphones that are supposed to stay locked in while running. Months later, as my over the ear Nike Vapor headphones became worn just before the Brooklyn Half Marathon, I felt it was time to finally try a pair of Yurbuds. Yurbuds can be purchased in two ways. Yurbuds can be purchased with headphones or with earbud covers that will fit over the Apple earbuds that come with the iPhone. The earpieces are sold in different sizes and can be sized up via the website or iPhone app. 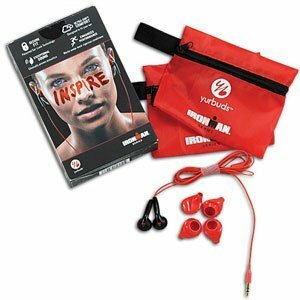 Since the sound quality of the Apple earbuds are abysmal, so I opted for the Yurbuds Ironman headphones. The sound quality on them are quite good, and may not be professional quality, but they sound very good for running with. The most notable thing about the Yurbuds are how the soft rubber tips on the earphones lock into the ear when inserted and twisted. My biggest complaint when originally testing them was that I had problems taking them out of my ear when someone was trying to talk to me, which may be a complaint when wearing casually, it is what I would want when wearing them while running. In addition to sounding good when running, the shape of the earphones let a runner hear clearly what is going on around them, so the runner can be aware of cars, other people and any other environmental sounds. The Yurbuds really are the best earphones I have found to run with. They stay in place as I run, pulling on them will not remove them from my ears, and the earphones sound good as I listen to books or music while I run. The Yurbuds helped me run the Brooklyn Half Marathon and train since then.